Habitat Well-drained soils in mountain forests, usually above 3,500 feet. Also can be found along the borders of streams, swamps, and bogs. 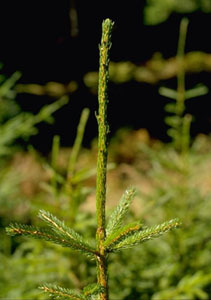 Characteristics Red spruce attains a height of 60-70 feet; the trunk of mature trees may have a diameter of 1-2 feet. 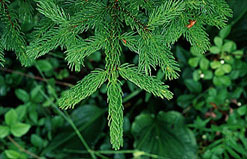 The needles are dark green or yellow-green and are 1-2"-5/8" long. The cones are 1-1/4"-1-5/8"long.